The concept of trust has always had a close relationship with business and nevermore so when it comes to contracts and agreements. When any contract is undertaken there is always a large element of trust taken into account; trust that both parties will stick to their side of the contract and trust that neither will end up in breach of contract. Although a great many people are sceptical of trust in business, an element of trust must exist in order for contracts to be signed and business deals made. However, it is generally thought that the good old days of a deal sealed with a handshake no longer exists. 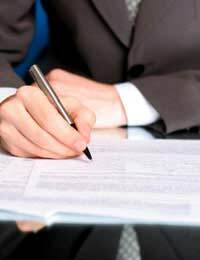 With lawsuits waiting to happen for every minor breach of contract, signed in ink contracts are a wise move. For some businesses trust does not need to enter the equation when cast iron contracts are used and insurance and liability clauses are used to cover any breach of contract. For many businesses, the value of trust is worth its weight in gold, or more accurately, business advertising. Finding a reliable, trustworthy business is sometimes more difficult that would be imagined and business people can spend years building up trust in business relationships. Where contracts are concerned trust can only go so far, hence the need for written contracts that are legally binding. In business, where a supplier not delivering goods on time can cause a knock on effect, trusting someone alone is not enough. Regardless of whether a contract is verbal or written, both parties are placing an element of trust when making an agreement to provide a service. In reality a contract is binding agreement and when the contract is breached there are legal consequences. Not only can the party who has breached the contract be made to pay financial damages to the innocent party but trust will be broken between both parties. Many people are under the assumption that verbal agreements place more emphasis on trust that written contracts. However, a verbal contract can be as legally binding as a written contract and can have the same legal consequences if breach of contract occurs. A number one rule when making any contract or agreement, regardless of whether it is verbal or in writing is to set out the terms and conditions. In order for the contract to be considered complete all terms and conditions must be clearly understood and accepted by both parties. Trust may play a part in contracts but will ultimately not hold much weight in a court of law. If disputes do arise, and a breach of contract causes financial loss, trust will be the first thing that falls by the wayside. Judges will be looking at the facts and the terms and conditions of the contract in order to settle the dispute. Broken trust may simply be a lesson learned as a result of a breach of contract, along with the knock on effects of financial loss and damage to the innocent party’s business. There have been cases where trust has played a part in court disputes over broken contracts. Where contracts have been formed and then broken, the judge may take into account the presumption of trust between both parties. This presumption of trust may be based on past business relationships where there has been no breach of contract in the past and the relationship is one of trust and confidence in the service expected. This could be said to be an influencing trust and may be taken into account in certain breach of contract disputes. Trust and contracts can be seen as a co-dependant partnership. Trust can be a concept that runs through all agreements and contracts from marriage contracts to simply buying goods from a local store, to visiting the dentist for a check-up. However a cautious person who puts more trust in the written contract may be do better when it comes to legal breach of contract disputes than those who put their trust in a verbal agreement and a firm handshake.